JIFNA, West Bank (CNS) — Suheir Saliba was running late as she prepared to go to the Easter Divine Liturgy with her husband, Aimad Kamal, and his family. Easter was the day to spend with her husband’s family. In Israel and the Palestinian territories, where Christians make up a little less than 2 percent of the population, it is difficult to find a family where there is no “intermarriage” between people from different Christian denominations. In Palestinian tradition, the women join their husband’s church after marriage, raising their children in that church, but most women also continue to attend religious ceremonies in the church where they were raised. Saliba’s mother was raised Greek Orthodox, but married her father, who was a Catholic. Two of her maternal uncles belong to the tiny Seventh Adventist Church, and a third uncle belongs to the Lutheran Church. “For me it doesn’t matter where I pray, I am attending God’s house. How the prayers are said does not matter,” she said. On Sundays she attends Mass with her mother at the Catholic Church and for holidays and special ceremonies she goes with her husband to the Greek Orthodox Church. She said sometimes it is difficult to follow the Orthodox prayers, so she simply prays in her heart. Though Saliba’s son, 12-year-old Fadi, has been baptized in the Greek Orthodox Church, he feels equally comfortable in the Catholic Church, and his parents will allow him to choose which church he wishes to attend when he gets older, said Saliba. 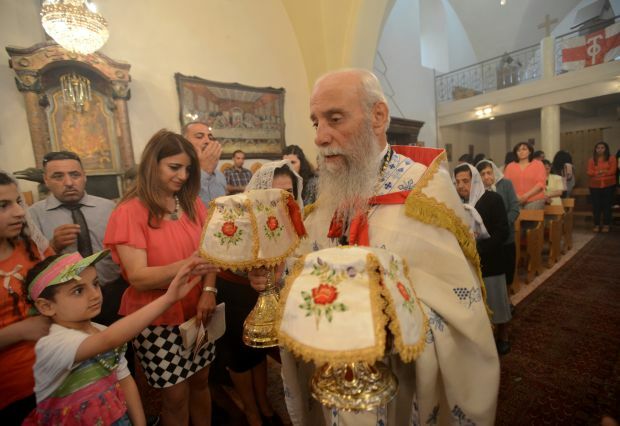 Kamal said that, in West Bank villages, Christians celebrate Christmas according to the date of the Latin-rite Catholics’ Gregorian calendar and Easter on the date it falls on the Julian calendar used by the Greek Orthodox. This year the date for Easter coincided on the Catholic and Greek Orthodox calendars, and Holy Land church leaders have decided that, beginning next year, they always will celebrate Easter on the same date. His mother is a Catholic, he said, and he attended the Catholic parish school, largely because there was no Greek Orthodox school. He was strongly influenced by the parish priest, and he said his path led to the vocation of priesthood in the Catholic Church. His Greek Orthodox father was happy that his son was happy, and now the family follows the Catholic tradition. In Father Rafidi’s family there are both Catholic and Greek Orthodox priests, he noted. Father Rafidi estimated that almost one-quarter of the students at the Latin Patriarchate seminary have come from Greek Orthodox families. He attributes this to the fact that there are very few Greek Orthodox schools in the area, while every Catholic parish has a parish school attached. In addition, he said, the Greek Orthodox hierarchy is largely Greek. He said the local Orthodox priests are encouraged to marry — as permitted in the church, although they then cannot become bishops. There is a big division between the local church and the Greek leaders, he said, whereas the Catholic Church historically has worked to create a local-led church. NEXT: Holy Fathers: Is being pope a shortcut to sainthood?